How does an industrial, hardware-oriented region – that has the research-driven electronics corporation Philips to thank for its growth – continue to be relevant in an area of open innovation and digitisation? 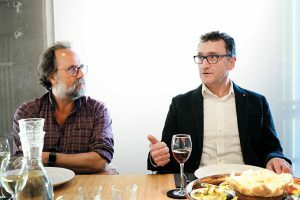 This question took centre stage in the round-table discussion that Link Magazine organised with design and innovation firm VanBerlo in Eindhoven at the end of last month. 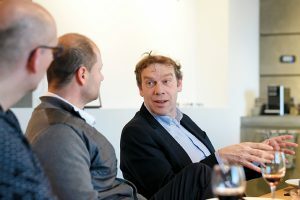 ‘Co-location’ proves to be one of the keywords: scientists, designers and engineers working together on innovation – as in the Innovation Powerhouse, where the round-table discussion was held, or in the Eindhoven Engine. This new initiative wants to have knowledge institutes and industry work out solutions to major (social) challenges together. Of course, the region is already active in the area of open innovation, also on a co-location basis, Steinbuch knows. He mentions the collaboration between the Máxima Medical Center in Veldhoven and Philips on healthcare innovation and the Holst Centre in Eindhoven, the open-innovation R&D centre of TNO and the Belgian imec. However, as the next big step, the Eindhoven Engine is supposed to scale up open innovation. The transformation that the region is undergoing from closed innovation, as in the Philips Natlab in the old days, to open innovation, for example at the High Tech Campus Eindhoven and soon in the Eindhoven Engine, must gain momentum. A great deal is expected of the spin-offs and start-ups. Ad van Berlo wants to know what their success factors are. Focus and passion, says Valer Pop, CEO of LifeSense Group (25 employees). In 2015, after having worked at the Holst Centre for ten years, he started his own company, which is now developing a training solution for women with incontinence problems. Smart underwear is fitted with sensors that detect activity and loss of urine, and based on the combined information, an app can advise the women about their training and encourage them by showing progress. ‘We can lose a customer within eight weeks, as seventy percent of the users will have been relieved of the problem by then. But there are as many as 200 million prospective customers worldwide.’ In other words, it is a promising technology and business case. Focus is an important element in developing it, according to Pop. ‘Given that possibilities abound, especially in the technological field, you have to make the right choices. A start-up relies on technology, design, business model and capital, but I often miss that combination at start-ups. Our ambition is to become the new Philips, but in a different way.’ The prospects are good, because the patented innovation has won many prizes and has been successfully introduced in various countries. And Pop has managed to attract the necessary substantial investments for scaling up. A key success factor was finding one hundred women with incontinence problems who started testing the product. Ad Vermeer can relate to Pop’s story. He is the inventor of the world’s first selective asparagus harvester, which automates the uncomfortable manual work of cutting asparagus and increases the yield. Cerescon, the company that is marketing the machine, is not the first start-up he has been involved in. Last month, after years of development, Cerescon (25 employees) delivered its first machine to a paying customer. ‘We have already had a user group, including asparagus growers, involved in the development for three years. It is surprising how they sometimes come up with other solutions than we can think of.’ Vermeer is now also seeing opportunities for selective harvesters for other crops, for which collaborative research needs to plant the seed. He has already received subsidy from Horizon 2020. 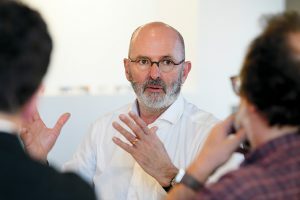 The round-table discussion was hosted by Ad van Berlo, founder of design and innovation firm VanBerlo, which moved into the Innovation Powerhouse in Eindhoven. This building is part of the heritage of the Philips corporation and was erected on the Strijp-T industrial estate in 1953 as a power plant for the Philips factories. On VanBerlo’s initiative, the property – building TR – was recently transformed into a high-profile business centre for innovative enterprises. 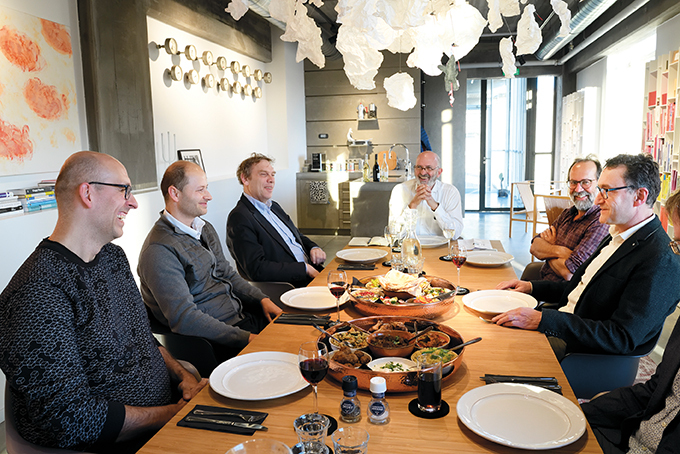 Vorig berichtExecutive Round-Table Industry on the strength of the Eindhoven ecosystem.